I have always found it exciting that the market is a lot like life; it’s always moving and keeps us on our toes. I enjoy using our disciplined investment strategies designed to navigate those ups and downs and openly communicate with clients. My goal is to help them achieve clarity with their financial well-being so that they can focus on enjoying life to the fullest. Are you ready to chat? We'd love to answer any questions you have, or just touch base on your needs. Shaunna Anderson has over 12 years of financial and operational management experience. She works with affluent families, individual clients and businesses to assess their current investment portfolios. 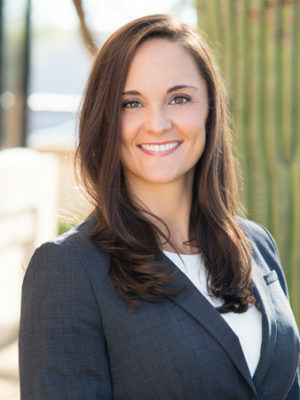 Shaunna seeks to understand their needs, set quantifiable goals and develop a customized investment strategy using a variety of investment products. Ongoing guidance and periodic reviews are routinely performed directly with clients to ensure investments remain in line with the client’s stated goals and objectives. Shaunna began her career with M.S. Howells & Co., an institutional broker dealer in Scottsdale. She worked alongside research analysts and traders to support hedge fund and portfolio managers. In 2009, she partnered with three tenured Financial Advisors to start Buttonwood Financial Partners. As the Branch Operations Manager, she created corporate procedures and developed business processes to support advisors and clients alike. In 2014, she was recruited by Merrill Lynch to work with a team of advisors. During her time at Merrill, she excelled in optimizing the team’s business model, implemented strategies to renew existing client relationships and worked directly with clients to review their portfolio and investment needs. Shaunna is a Georgia girl at heart but calls Arizona home. In her spare time, she can be found on an adventure in the great outdoors. Whether on mountain tops, exploring foreign lands or just enjoying being active, she believes adventure is imperative for health and personal growth. Securities offered through Independent Financial Group, LLC (“IFG”), member FINRA/SIPC. Advisory services offered through Wealth Management, LLC, d/b/a Henry+Horne Wealth Management (“HHWM”), a registered investment advisor. HHWM and IFG are separate and unrelated entities. Henry+Horne and Henry+Horne Wealth Management LLC are separate entities. Information is provided from sources believed to be reliable; however, we cannot guarantee or represent that it is accurate or complete. Because situations vary, any information provided on this site is not intended to indicate suitability for any particular investor. Hyperlinks are provided as a courtesy. When you link to the 3rd party website you are leaving our site and assume total responsibility for your use at these sites.